Betsoft’s creative, highly animated 3D slots have allowed them explore several themes that many of their competitors typically shy away from. In 2015 they took on the classic fairy tale of Pinocchio and turned it into a fully functioning 5 reel slot with animated characters and high definition sound. They also challenged themselves with a slot game themed on the scary tale of Jekyll and Hyde, which has proven a hit with many players. So it is no surprise that the company well known for fun and artistic slots should eventually turn their attentions to the incredibly popular fictional character Frankenstein. There can’t be many people that have not heard of Frankenstein - a fictional monster created in an alchemist’s lab. The original story was written in 1818 by author Mary Shelley when she was only 20 years old. There have since been multiple films and TV shows featuring the enigmatic and grotesque monster and his young creator. This beautifully animated slot contains many symbols from Dr Frankenstein’s lab, including jars with buldging eyes in, electric dis-chargers, spooky moons and the two main characters as well as the usual A-K-Q-J-10. There is a scatter symbol and a bonus symbol that unlock two different features and these symbols are only located on 3 of the 5 reels. Wild symbols are located on all reels and play a part in the free spins bonus. There are two bonus features in Frankenslot’s Monster – a free spins bonus and an instant win bonus. The instant win bonus is triggered by landing 3 bonus symbols at the same time on reels 1, 3 and 5. This will initiate a new screen where you select the voltage for Frankenstein’s monster and a random award of up to 25x is delivered. The free spins bonus is a bit more interesting, requiring scatters on reels 2, 3 and 4 to be activated. You are awarded 8 free spins initially with the chance of triggering 8 more if the 3 scatters land on reels 2, 3 and 4 during the feature. During each spin Frankenstein’s monster is electrified and he throws 1 – 3 wilds into random positions on the reels. 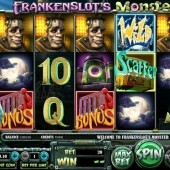 Frankenslot’s Monster is a wonderfully designed slot with great animation and sounds. However it is lacking any big win excitement in my opinion. The lack of volatility in this slot means that you end up playing to enjoy all the comical gestures of the 3D characters rather than playing for any big payouts Perhaps there is a curse with Frankenstein as I can no longer find NetEnt’s Frankenstein available at any casinos. Let's hope Betsoft's version hangs around a little longer!